Humans do not have natural external insulation. We have no covering outside our skin like most other animals do such as fur or feathers. This requires us to wear clothes to help stay warm and dry. When we stay outside at night, our bodies need even more insulation because our bodies cool down while sleeping. Smart people a long time ago figured out the best way to stay warm outside at night is to use a sleeping bag. What thoughts does a sleeping bag bring to mind? Make a list. Your list probably includes things like warm, cozy, or comfortable. Did your list include things like sleep, rest, or refreshing? How about heavy? We might complain about having to carry a heavy sleeping bag, but when night comes and we are tired we are always glad to have a sleeping bag to crawl into. A sleeping bag is a perfect symbol for rest and rejuvenation. 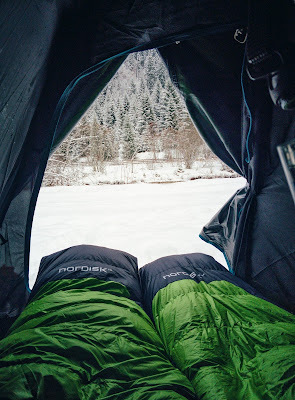 A sleeping bag provides all the parts necessary for making sleep possible outside. It provides a barrier to the outside world and it provides insulation against cold temperatures. It even provides some cushion that makes sleep more comfortable. Jesus promised in Matthew 11:28 that when we come to him he would provide rest for us. He provides all the all the things we are lacking and takes our worries and stress so that we can experience true rest from the cares of this world by trusting in him. Do you ever fell tired from dealing with all the struggles of life? Can we share our struggles and burdens with others? Will this help us bear them more easily? Why do we try to carry all of our struggle on our own when Jesus promised to give us rest?